Considering Community: What’s a community anyway? I’ve decided to start a new series of occasional posts focused on community management tips and related information. I’m tagging these Considering Community and you’ll be able to find all the posts in the series here. In the first post in this series about online communities, we looked at the different types of communities – from communities of practice to those of place. Now let’s think about definitions from a different angle. I say community, you say… community? In recent times, the word community is being increasing adopted by organisations but, confusingly, it can have different meanings. Sometimes it’s a rather vague term indicating “something to do with communicating via social media”. In other situations, community is used as a more “friendly” way of referring to customers – whether that’s customer support, customer feedback, and/or marketing activities. In yet another set of scenarios, community is used to refer to multiple, distinct groups, all of whom may be interacting with the organisation is slightly different ways, and not necessarily online. While none of these interpretations are necessarily wrong, they don’t help to clarify the usage of a word that has ended up feeling somewhat ambiguous. So, can we be a bit more nuanced in our definition of what we mean by community without using more than the equivalent of a few tweets to do so? And can we use that definition to help us work more effectively with communities? The introduction of a paper that I read recently looked at how a range of disciplines describe online communities; I share its examples and some additional ones below. I then consider an over-arching definition of community and what it might tell us about how to successfully engage different communities. “Social aggregations that emerge from the Net when enough people carry on public discussions long enough, with sufficient human feeling to form webs of personal relationships in cyberspace.” – Howard Rheingold, 1993. “Computer-mediated spaces where there is a potential for an integration of content and communication with an emphasis on member-generated content.” – Hagel and Armstrong 1997 (with an emphasis on business models). “Groups of people who interact primarily through computer-mediated communication and who identify with and have developed feelings of belonging and attachment to each other.” – Blanchard and Markus, 2004. 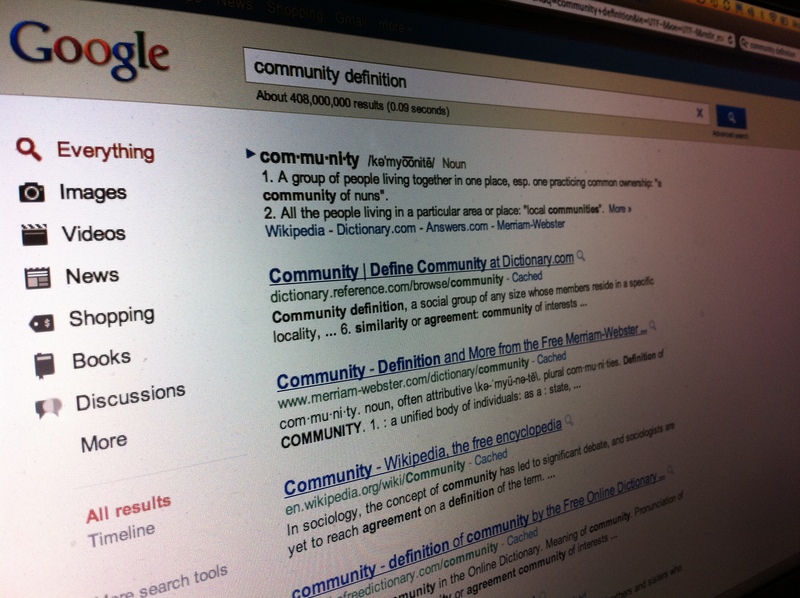 Defining community – going beyond a Google search. People + online tools + communication –> content creation –> relationships + feelings of belonging. There’s an additional point to be emphasised here, which is that community refers to a group where people have relationships with each other, not just one-to-one relationships with a central hub – whether that hub is a leader figure, an organization or a product. Not every member may be connected directly to every other member, but they almost certainly do have interactions with more than one other person in the group. This inter-connectedness of members encourages us to think of communities as an ecosystem – where the actions of individuals may propagate through the system in ways that cannot be controlled from a central point. As we’ve all seen on social media, you can start a hashtag campaign, but you can’t decide what content gets posted to the hashtag. And this becomes an important distinction from more traditional marketing and customer service models where interactions were more contained. People – Do you know who is in your community or who you’d like to see join it? In order to identify potential new members, you might look for who tweets on relevant hashtags and who uses those hashtags in their online bios. Events are another good place to meet future community members. Tools – You don’t necessarily need to provide the communication tools yourself, but you do need to be present on the channels that your community is using – whether that’s twitter, a blog network or a listserv. The channels you choose to use will depend largely on what you hope to accomplish through your interaction with the community: if it’s customer service you may need to be in multiple places where the conversations are happening, if it’s about assisting a group to organise an event, it may be that a single, central online home is needed to plan and share resources. Communication – I think a key question to ask here is: Where can you usefully fill any communication gaps, while also respecting that you don’t need to be visibly part of every discussion? I mentioned above that a community is an ecosystem, and that means giving up the idea of dominating all the conversations and thinking about how you can make useful contributions with any content that you do create. This could be making sure that you’re clear about new developments on the project, visibly introducing and welcoming new members, and sharing details of opportunities for the community to meet in person. Content creation – What does content creation mean to your community goals? Is it just the back and forth that happens on social media, or something more structured such as guest blog posts sharing tips and activities, or even co-creating a book together? Relationships: Remember: you don’t control all the relationships in a community! And one way you can add value if you’re hosting a community is to help members to build relationships with each other. People love meeting like-minded people and this will result in a greater sense of belonging within the community as a whole. This entry was posted in Considering Community, Online Communities and tagged definitions, online communities. Bookmark the permalink.